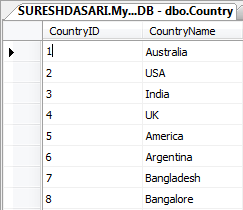 Here I will explain how to change identity column seed value in SQL server 2008 or reseed identity column seed value of table in SQL server or how to change identity column value in SQL server. Dear Sir , I am facing a problem in project,using database MySQL . sir when i delete id =1 value again when i insert the record i want taht the record with id=1 should inserted how to do this sir? Hi Sanajana, See this can help you.